bareMinerals 'The Power Neutrals Collection' Ready Eye Shadow 8.0 in The Power Neutrals ($40, Press Sample) is a gorgeous neutral palette with the most wearable shades of browns, greens and greys. The palette has a lovely mix of warm and cool shades and also a nice combination of metallic and matte finishes. bareMinerals' Ready eye shadows are some of favourite eye shadows as far as pigmentation, blendability and textures go. The overall quality is great and this little palette is no exception. The shades are buttery smooth and blend like a dream. There is a little bit of fallout from the matte shades, but nothing crazy. The shimmery metallics are finely milled too and there's no gritty glitter to deal with. There's not one shade that I do not like in this palette. There are a couple of shades that seem a tad light for my skintone, but I quite like to use them while blending the colors out or as transition shades while softening colors and they layer well too. 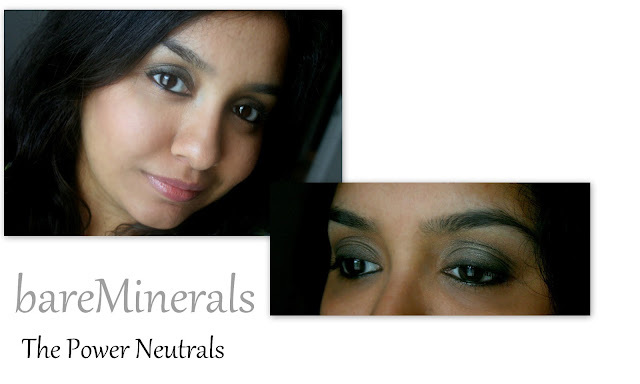 Overall, its an amazing palette with a gorgeous selection of everyday, wearable neutrals. If you tend to gravitate towards neutrals and murky greys and browns, this fantastic palette is something you'll love! What are your thoughts on bareMinerals 'The Power Neutrals' Ready 8.0 Eye Shadow Palette? These look GORGEOUS! Ugh, now I reaaaaaaaaaaalllllllyyyyyyyy want this. I've always wanted to try Bare Minerals eyeshadows. They have some amazing eye shadows! If you haven't tried them, check out the duos...there are some very pretty everyday neutrals in there! this is so pretty! You look fab!